Gladiators were divided into different classes according to their weapons and fighting styles. There were strict rules and protocol surrounding the fights of gladiators. A gladiatorial fight at a funeral would involve two gladiators, called the Bustuarii, who fought to the death. What type of gladiator was a Bustuarii? What weapons and armor did they use? What was their style of combat? And what type of gladiator was matched as their opponent? - Weapons: This type of gladiator fought with a sword (the gladius). The specific type of sword was the leaf-shaped Gladius Graecus which was originally used by the hoplites. Hoplites were the citizen-soldiers of the Ancient Greek City-states which included Sparta. Gladiators were first exhibited at Rome in B.C. 264, in the Forum Boarium, a cattle market, by Marcus and Decimus Brutus, at the funeral of their father, who was a consul named D. Junius Brutus Pera. These gladiatorial fights were at first confined to public funerals, but afterwards fought at the funerals of wealthy people of consequence and even at the funerals of women. Romans sometimes left a sum of money in their will to pay the expenses of such an exhibition involving Bustuarii at their funerals. The name Bustuarii was derived from the word ''bustum, or funeral pile of a deceased person, in the funeral ceremony. Why was a Roman funeral chosen as a fitting place to hold a gladiatorial fight? The religion of the Romans revolved around the worship of various gods and a strong belief in an afterlife. The Romans believed that "souls of the dead were propitiated by human blood..." The early Romans therefore believed that human sacrifice at the dead person's funeral would appease the Roman gods and ensure a safe entrance into the afterlife. Preparation for Roman funeral rites involved captives or slaves being bought, trained to kill as Bustuarii and then sacrificed during the funeral rituals which were called a munus. 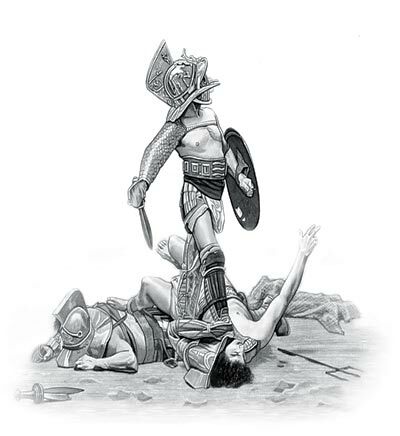 The content of this Bustuarii category on the different types of gladiator who fought to the death in the gladiatorial combats staged in Ancient Rome provides free educational details, facts and information for reference and research for schools, colleges and homework. Refer to the Colosseum Sitemap for a comprehensive search on interesting different categories containing the history, facts and information about Ancient Rome. Interesting facts and information on this type of gladiator: their weapons, their armor and their style of combat.